Here is a sample of the latest work, both commissioned and personal that I have completed. Recently (and somewhat hastily) completed for and published in Somerset Studio, the July - August 2008 edition, this piece is a collage of papers with various decorative treatments and additional ephemera. I was most fortunate to get four colour pages in the issue, which included my Scarborough Fair piece, detail shots, the article I wrote about creating the piece as well as a full page reproduction of this work, Mystic Art. 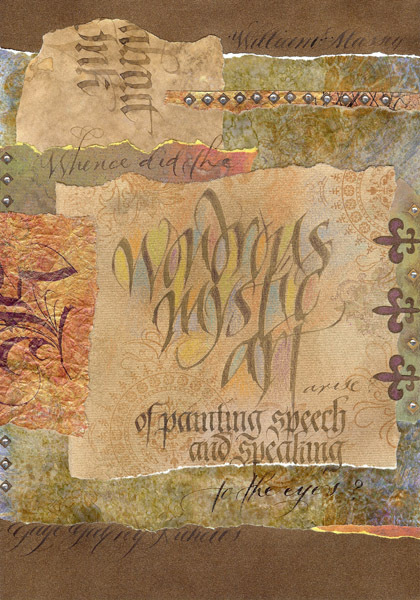 This collage utilises an old (1991) piece of calligraphy scanned and printed on tracing paper, sprayed with Moonshadow Mist and detailed in pencil. 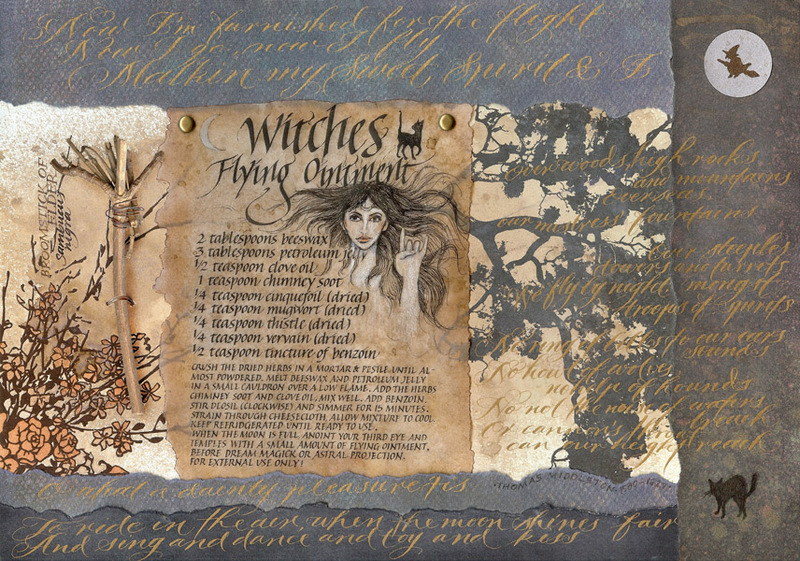 It was collaged onto a ground of altered stationery and the tiny witch's broom was made from elder twigs saved from one of my elder trees from my old flat. The recipe was found in a witchy book and I adapted the ingredients to be more ethically acceptable - the original called for baby fat! The witch is based on Kate Bush who I have loved for many years and who always seems to manifest in my drawings of women! I have submitted it to Somerset Studio for their Halloween issue (September - October 2008). My submission for the 2009 Calligraphers' Guild of WA Inc Calendar. The lovely text is from Robert Herrick, a 17th century poet. Despite being a clergyman he wrote some surprisingly bawdy poems about pre-christian deities. 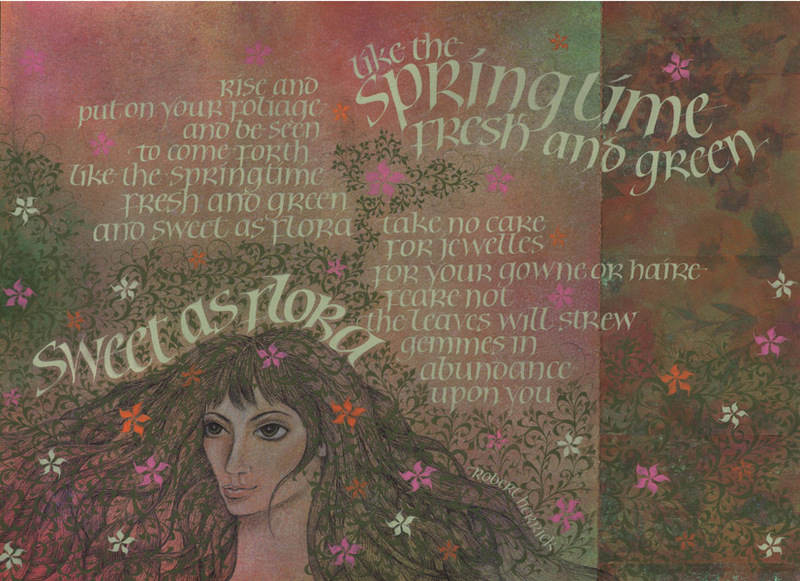 The artwork continues my current preponderence for pen-drawn foliate flourishes and was inspired by Botticelli's fabulous painting Primavera where Flora the Goddess of Spring is clothed in foliage, making a pleasing synchrony of Herrick's text and a tribute to Botticelli's art. 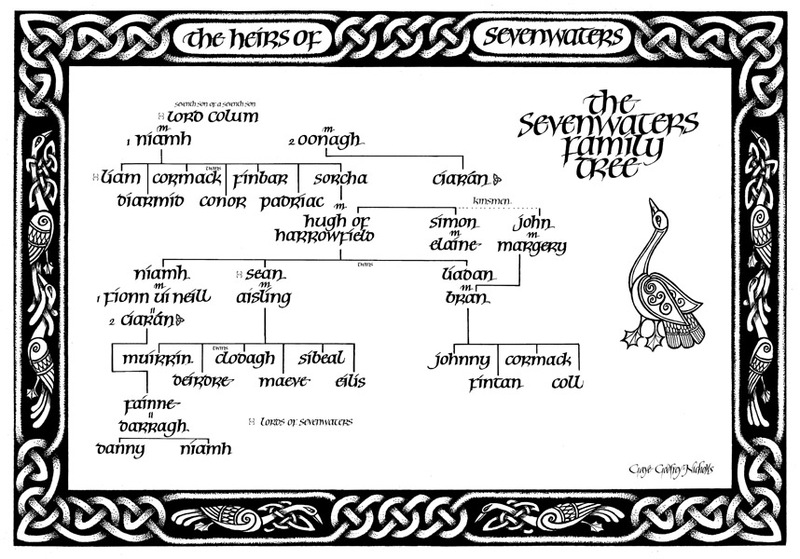 The celtic hybrid script used was originally created by Denis Brown. A commission for a client, this piece follows a long tradition of Quaker Wedding Certificates. The wedding vows of each of the couple are written out in their entirety, along with relevant decoration and space is left underneath for all the guests present at the ceremony to sign. This touching and inclusive way of sharing the occasion is generally considered to be the core of the marriage ceremony witnessed by and including all present, rather than a single celebrant. 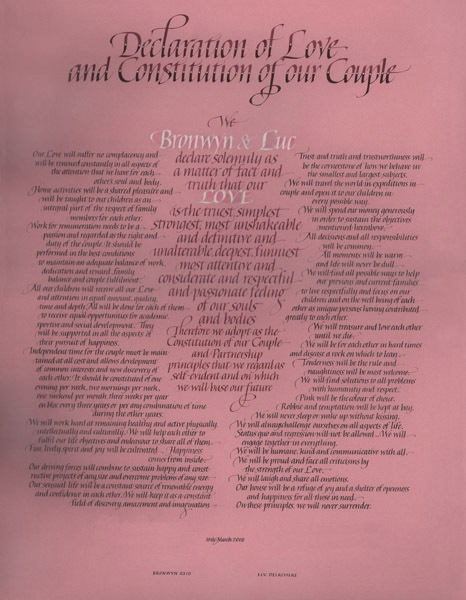 A Declaration of Love completed for a client is the couple's relationship constitution. It is a large amount of text and the final piece was quite large. As it is with jobs that are lengthy, layout and legibliity were important considerations and I chose to break the text up by splitting it into two columns, united and introduced by a central panel. This presented planning challenges as I didn't want to write the text out too many times. As it turned out, I prepared a finished rough that was very close to the final piece, which nonetheless required some minor adjustments. 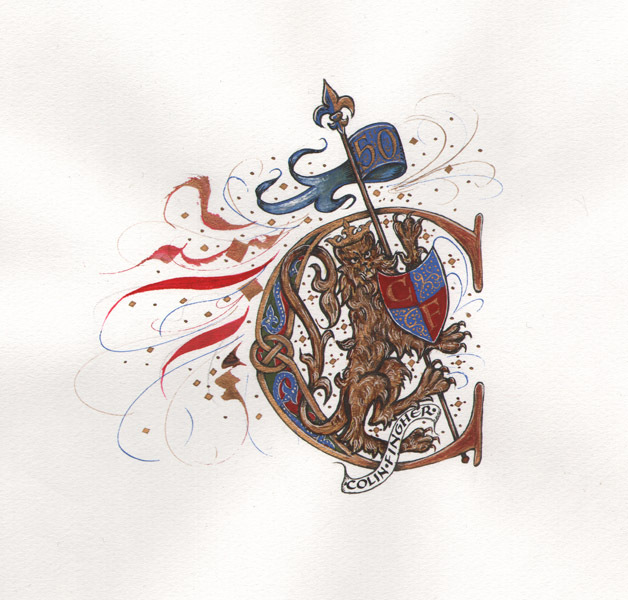 This commission was specifically requested by a client who admired Donald Jackson's heraldic E for Queen Elizabeth II. Various modifications were made to personalise the work and I felt it was iomportant to avoid blatantly copying Donald's fine work (I like to think of it more as a tribute than a knock off! ).